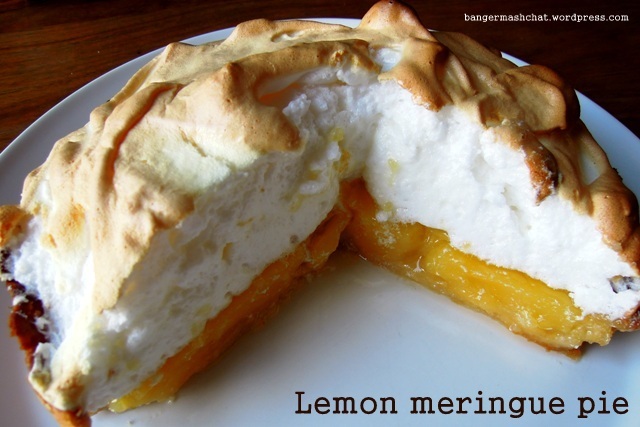 I’ve been meaning to try making a lemon meringue pie for ages now. I thought they were fussy, complicated puddings to make, but I finally got around to it last weekend and it turned out to be so much easier than I was expecting. I used a recipe from master baker Dan Lepard, and it was indeed as simple as he promised. The pastry is perfectly light and crisp, while the meringue is soft, fluffy and marshmallow-like. I made one slight change and that was to add some lime juice to the proceedings. I like a lot of contrast in my lemon meringue pie. 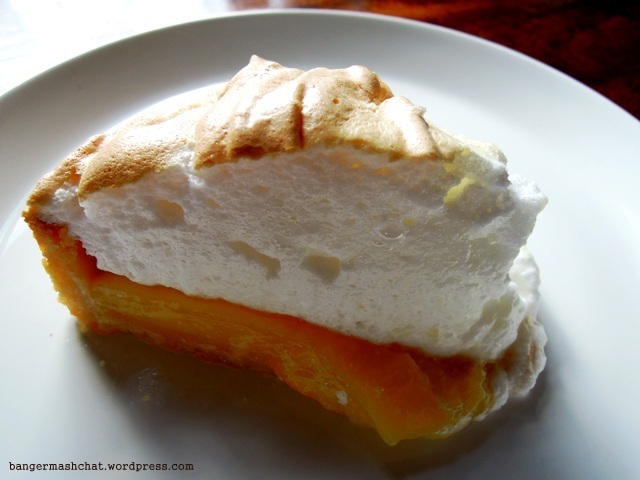 The meringue has to be verging on sickeningly sweet and so that must be counteracted with a really tangy sharp citrus. I like super tangy. Lime as well as lemon is perfect for that. The pie went down well with the whole family, particularly Jessie who isn’t generally much of a pudding girl. She came back for seconds. And I enjoyed the leftovers for breakfast on Easter Monday – ever so decadent. NB instructions for Aga cooks are at the end of the recipe. To make the pastry, put the flour, salt and sugar in a bowl. Chop the butter into small pieces and rub into the flour. Mix in the egg yolk and water to form a soft paste. Wrap in clingfilm and chill in the fridge for half an hour. Dan Lepard says to take a 20cm round deep tart case with a removable base but I used a cake tin. Grease your tart case or cake tin. Roll out the dough fairly thinly and line the tin’s base and sides. Press gently into the sides, trim the edges and then chill for another half an hour. Preheat the oven to 170C or Gas Mark 3. Line the pastry case with greaseproof paper and weigh down with baking beans. Bake the pastry case for 20 to 25 minutes. Then remove the paper and bake for another 5 to 10 minutes until the pastry is dry and golden. Leave to cool. To make the filling, place the lemon, lime and orange juices in a saucepan with the sugar, cornflour and egg yolks and whisk until smooth. Place over a low heat and add the butter. Keep stirring while it comes to the boil. Pour the filling into the tart case, leaving a slight gap at the top. Leave to cool completely. For the meringue, beat the egg whites in large bowl with an electric mixer until soft peaks form. Gradually add the sugar, a tablespoonful at a time, beating in well before the next lot of sugar goes in. 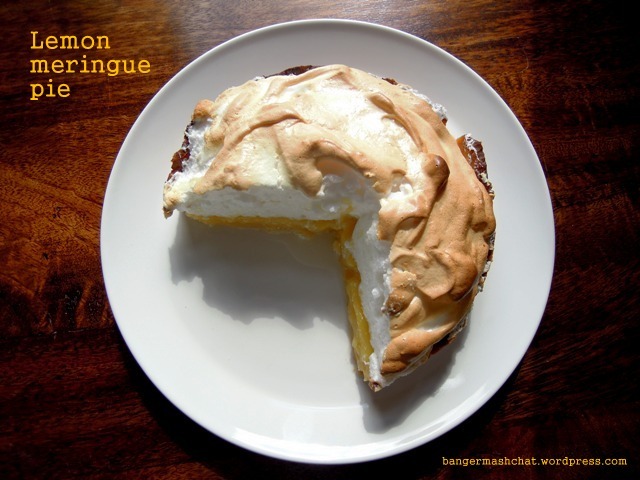 You should end up with a thick and glossy meringue. Spoon the meringue on top of the lemon tart. With the oven still set to 170C or Gas Mark 3, bake for roughly 25 minutes until golden and the meringue has set but is still soft. Leave to cool before serving. If you’re using a two-door Aga like me, bake the pastry case on the floor of the roasting oven for 10 to 15 minutes, before removing the beads and baking for a further 5 minutes or so until the pastry is golden. To cook the full pie, start it off in the middle of the roasting oven for about four minutes until the meringue turns a light brown. Then carefully move down to the top of the simmering oven for another 20 minutes until the meringue is set. Looks very yummy, live the idea of eating the leftovers for breakfast! Thanks Andrea. Yes, totally indulgent I know, but it is such a shame to waste good leftovers! I could definitely eat that for breakfast too. Looks gorgeous! Well, there’s nothing wrong with eggs and fruit for breakfast is there? One of my favourite puddings and this is a really superior one! I love how you’ve used all those different citrus fruits in the filling too, just delicious! Thank you so much! Yes, it is a very zingy lemon meringue pie. Wakes you up in the morning too! Oh my, this is my kind of pudding (and my kind of breakie too!). Loving the usage of so much citrus to give a big zing. I’ve never made one but am most tempted now. Lovely. That looks delicious! I’ll have to try this out for my grandma – it’s her favorite! I reckon you should get someone else to make this for you as a treat once the baby is born – you’ll have enough on your hands!